XRCEL – “Little kid in a big body” is a phrase you use to describe yourself, tell us why. FL – “Little Kid Big Body” first came into existence during my sophomore or junior year of high school. Growing up I was always the smallest of my friends but once I grew into the frame and size I am now, I was then the biggest of most of my friends but wasn’t used to it quite yet. In my head, I was still a little kid, but now I was in a larger body and couldn’t jokingly horseplay or “play fight” anymore because I was stronger than my peers. Once I got to Wofford and started playing college ball, I used the phrase or hashtag “#LittleKidBigBody” as a reminder to myself to not lose sight on why I started playing soccer in the first place – because it was more fun than anything else in this world and everything I laced up my boots it felt like I was a little kid on Christmas. And that feeling still resonates with me today. XRCEL – How would you summarize your soccer career to date? When did you start playing, and who was your biggest influence? FL – Simply put, a roller coaster. I first started playing when I was 3 or 4 years old so essentially as long as I can remember. I had a handful of influences growing up. Some I knew personally, some I just knew of, and even some I just watched on television. But one of the most influential people for me during my career thus far has to be my assistant coach from college, Joel Tyson. I genuinely believe that without the advice, direction, and lessons learned from Joel during my 4 years at Wofford, my career would’ve never gone in the direction it has since graduating from Wofford. XRCEL – What are biggest accomplishments in soccer? Is there a particular award, game or play that stands out in your mind as being “epic” for you? FL – That’s tough to say. I’ve been extremely blessed to have had continuous success since pursuing a professional career. If I had to pick a few I would say earning All-American honors my senior year of college, scoring my first professional goal my rookie year during the conference playoffs to send our team into the next round, earning back to back All-League first team XI honors in the USL, or earning the USL Defender of the Year award this past season. 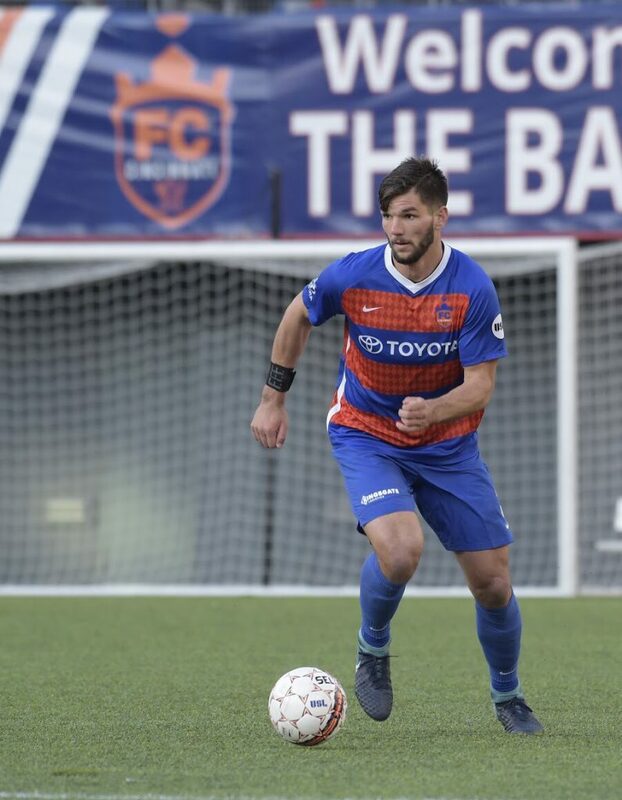 XRCEL – How has the move from Charleston Battery to FC Cincinnati been? FL – The move has been excellent. Extremely easy. Everyone from the front office, to the operations team, to the fan base, and community made the transition a breeze. They embraced and supported me from day 1 and made representing the city natural. Cincinnati is home. XRCEL – How would you describe your playing style? FL – I would say I am extremely physical, defensive tone setter who likes to play out of the back/keep possession while also keeping things simple with no risks. XRCEL – How has XRCEL helped you in your performance? FL – XRCEL for me has been huge in my performance. I started using XRCEL in college, at Wofford. In college I took XRCEL strictly before games. Professionally, I take one XRCEL prior to warm ups, one prior to kickoff, and one at half time. I usually take one XRCEL prior to training days as well when the work load is heavier than usual or when there are extreme temperatures. XRCEL, for me, keeps me consistently fueled without the fear of cramps or any mental or physical fatigue. XRCEL – Do you have any specific words you live by? FL – I have a few sayings that I live by but those stories will have to be shared another time.